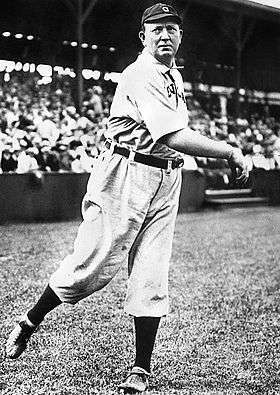 Cy Young, the all-time MLB complete games leader. In baseball, a complete game (denoted by CG) is the act of a pitcher pitching an entire game without the benefit of a relief pitcher. A pitcher who meets this criterion will be credited with a complete game regardless of the number of innings played - pitchers who throw an entire official game that is shortened by rain will still be credited with a complete game, while starting pitchers who are relieved in extra innings after throwing nine or more innings will not be credited with a complete game. A starting pitcher who is replaced by a pinch hitter in the final half inning of a game will still be credited with a complete game. The frequency of complete games has evolved since the early days of baseball. The complete game was essentially an expectation in the early 20th century and pitchers completed almost all of the games they started. In modern baseball, the feat is much more rare and no pitcher has reached 30 complete games in a season since 1975; in the 21st century, a pitcher has thrown 10 or more complete games in a season only twice. In the early 20th century, it was common for most good Major League Baseball (MLB) pitchers to pitch a complete game almost every start, barring injury or ejection. Pitchers were expected to complete games they started. Over the course of the 20th century, complete games became less common, to the point where a good modern pitcher typically achieves only 1 or 2 complete games per season. (In the 2012 MLB season, 2.6% of starts were complete games.) To put this in perspective, as recently as the 1980s, 10–15 complete games a year by a star pitcher was not unheard of, and in 1980, Oakland Athletics pitcher Rick Langford threw 22 consecutive complete games. Years earlier, Robin Roberts of the Philadelphia Phillies threw 28 consecutive complete games, spanning the 1952 and 1953 seasons. James Shields threw a total of 11 complete games in the 2011 season for the Tampa Bay Rays, becoming the first pitcher to reach double digits in a single season since CC Sabathia threw 10 complete games for the Cleveland Indians and Milwaukee Brewers in 2008. The last pitcher to throw as many as 15 complete games in a single season was Curt Schilling, who accomplished that feat for the Philadelphia Phillies in 1998. The last pitcher to throw 20 complete games in a single season was Fernando Valenzuela, who did so for the Los Angeles Dodgers in 1986. The last pitcher to throw 25 complete games in a season was Rick Langford, who had 28 for the Oakland Athletics in 1980. The last pitcher to throw 30 complete games in a season was Catfish Hunter, who did so for the New York Yankees in 1975. All pitchers above are right-handed, except for Eddie Plank. All pitchers right-handed except Matt Kilroy and Toad Ramsey. Jack Taylor completed 187 consecutive games he started between 1901 and 1906. Leon Cadore and Joe Oeschger share the record for the longest complete game, achieved when they pitched against each other in a 26-inning marathon that ended in a 1–1 tie on May 1, 1920. ↑ Dickson, Paul (1999). The new Dickson baseball dictionary. Houghton Mifflin Harcourt. p. 130. ISBN 978-0-15-600580-7. Retrieved August 27, 2011. ↑ "2013 Major League Baseball Pitching Splits". Sports Reference LLC. Retrieved May 27, 2014. ↑ Zimniuch, Fran (2010). Fireman: The Evolution of the Closer in Baseball. Chicago: Triumph Books. pp. 73–4. ISBN 978-1-60078-312-8. ↑ "Active Career Leaders in Complete Games". Baseball Reference. Sports Reference LLC. Retrieved May 27, 2014. Baseball Prospectus Team of Experts (2007). Baseball Between the Numbers: Why Everything You Know About the Game Is Wrong. New York, New York: Basic Books. ISBN 978-0-465-00547-5. Retrieved March 5, 2011.